Complete guide and the list of the best kitesurfing spots in Kalpitiya, Sri Lanka and possibly the best kitespots in the world. 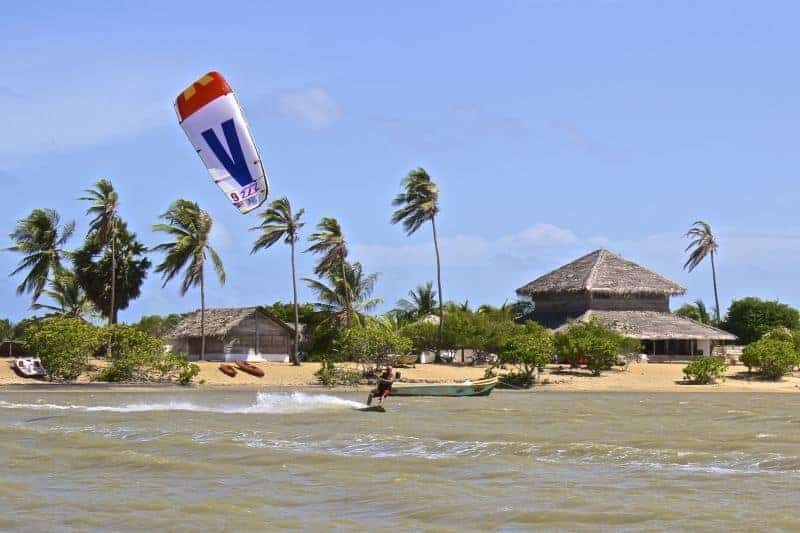 So people say Kalpitiya is one of the best kitesurfing destinations in the world, huh? Hmm, speaking of worldwide, It may not quite cut the mustard, but Kalpitiya should definitely be on the list of "the best kitespots in Southeast Asia". Located in the Puttalam district, North-Western province of Sri Lanka, this tiny fishing village and its 14 surrounding islands are well known for its natural untouched beauty. In fact, Kalpitiya is nothing more than a pretty long and narrow strip of sand separating the lagoons from the Indian Ocean. For kitesurfing, this is the dream come through. It is definitely one of the windiest destinations on earth, that's a sure thing. So what's so special about this place? There is this very unique Venturi effect that runs through. The wind gets sucked through the Palk Strait channel and picks up on strength as it travels along the coast. By the time it reaches the Vella Island, it’s almost doubled in speed. Kalpitiya is on the map as one of the spots with just the perfect kitesurfing conditions during summer as well as winter, and it still remains one of the very few kitesurfing destinations that are unspoiled with resort chains, noisy nightlife and tourism. If this is still to come? Who knows, but for now, it is just the perfect tranquil hideaway for those who appreciate a bit of peace ‘n’ trees. Literally. There are two main seasons in Kalpitiya. The summer wind season is starting from May all the way till the end of October. Strong South-West winds in the summer season reach to 15 knots at least pretty much every day, all day long. In June the wind blows even stronger. It usually increases to around 20-25 knots and may pick up to incredible 35 knots sometimes. More waves and chop come during this season. Winter season usually starts around mid December and goes all the way till the end of March. You can still get a few awesome kitesurf sessions in April. Winter winds are coming from North-West, usually cross-shore and much lighter, reaching from 12 to about 20+ knots. In the past year or so, there's been a few 'waiting around for the wind' periods in the winter season. The wind in summer is definitely a lot more reliable, so if you have a choice of when to visit Kalpitiya, opt-in for the summer. Both summer and winter seasons are warm and sunny and the changing direction of the wind just makes each of the kitespots a brand new experience. There are quite a few kitespots in Kalpitiya offering a range of conditions from waves to flat with a chop to butter flat. It’s just an awesome contrast of the flat water in the lagoons and the wave of the Indian Ocean just on the other side of the sand bank. Kalpitiya Lagoon - The lagoon is about 800m wide and well over 2km long, so that just gives you an amazing playground with nearly flat water surface with just a few chops here and there. At its deepest spot, the lagoon is only about 1.5m deep making it perfectly suitable for all skill levels, but mainly for the beginners and the newbies taking kitesurfing lessons. Make sure to pack a pair of booties. There are sharp shell fragments and sea urchins at the bottom of the lagoon that you don’t want to step on. The lagoon does get quite busy, sometimes with around 30 kites at the time, but there’s still enough space for everyone, so nothing to worry about. There are few waves out in the open ocean from the other side of the sand bar, but you will hardly ever see someone kiting there. The water is just too choppy and not very pleasant to ride on. Donkey Point - This kitespot is about 20 minute tuk-tuk ride down South-west from Kalpitiya. It offers a few good sized waves here if the swell is good, so if you’re into wave riding then you could hang around here for the day. The wind here is mostly on-shore which makes Donkey Point relatively safe and suitable kitespot even for the beginners. Once you’re done here, this kitespot is a perfect starting point for the 7km downwinder back to the Kalpitiya lagoon. This ride will require some skill though as you’re going through the ocean, so if you're still a bit shaky on your board, opt-in for tuk-tuk instead. Ippantivu Island - The setup here is very similar to the Vella Island. In fact the locals call this little island "Mini Vellai". The bay in the middle is quite protected, so you get a nice flat water conditions with quite stable offshore winds. In the summer season, you can take an awesome downwinder to the Dream Point, but the water can be a bit choppy. Dream Spot - this kitespot is just a short trip away from the Kalpitiya Lagoon. It is basically a sand bar separating the Indian Ocean and the lagoon, but it offers perfectly flat water surface on one side and a friendly waves on the other. Vella Island / Magic Spot - This is an epic kitespot, the best in Kalpitiya, if not the best kitespot in the entire Sri Lanka. Vella Island is a long sandbar stretching over the Portugal Bay located around 25km from the main lagoon. In fact the island is nothing more than a sandy cay with a few sun huts on it, but the wind and water conditions here do the magic. It is about 45 minutes boat ride up North through the Dutch Bay right into the Portugal Bay. The curvy shaped sandbank creates the perfect flat water lagoon protected from the outer ocean. The water is perfectly flat with no chop and as the wind travels through the channel and picking up on strength, you’ll get fantastic 20+ knots stable, predictable wind here. It is much stronger breeze here than the lagoon. This spot is pretty much only kitable during the summer season when the wind blows off-shore to the Vella Island. So if you’re thinking a ‘downwinder’, yep, we’re on the same boat. In fact, make sure, you’ll get one of the kiteschools around to organise a safety boat to follow. Kappalady Lagoon - This tiny lagoon only fits about 15 kiters at the time, so it’s good for a warm-up session or to practice a few tricks before it gets too busy. It has pretty calm flat surface with good and steady wind and about a waist deep water. The lagoon is not directly connected to the ocean making this kitespot pretty safe for the beginners, but as you can guess it’s just not anywhere near the other local spots. Kalpitiya definitely offers some great spots, the only negative is that most of them are only suitable for more experienced riders. So if you're a total beginner, unfortunately you'll be stuck with the muddy lagoons for starters. There are several UNESCO world heritage sites you can visit in Sri Lanka. The closest to Kalpitiya is the so called ‘Cultural Triangle’ of Anuradhapura, Sigiriya, Polonnaruwa and Dambulla. Check out the Wilpattu National Park for an awesome day trip. If you have a few days to spare, venture out to the East coast of the Island and take a train trip from Kandy to Ella through the Ceylon tea highlands. It is meant to be most scenic and beautiful out of all the train journey in the world. If you happen to be in Kalpitiya during the winter season, go check out the popular Arugam Bay on the east coast, not only for an epic surf, but also to watch the dolphins and whales as they migrate south during winter. There are several diving and snorkeling sites out in the reef worth visiting, or just take a SUP session in the mangroves. Are you planning kitesurfing holidays to this wonderful part of Asia? Check out this list of the best kitesurfing spots in Rameswaram, India and put it on your list.